S corporations and Limited Liability Companies (LLC) are common entity choices for small business owners. S corporation shareholders and LLC members often benefit from certain tax advantages that are available to them. At the same time failure to correctly adhere to tax laws affecting these entity types can result in erroneous tax return filings that can result in significant IRS penalties. 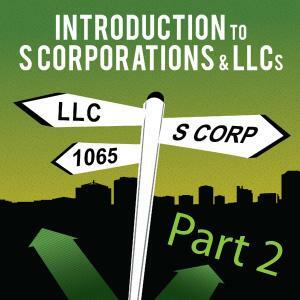 Introduction to S Corporations and LLCs is a two-part course which provides tax professionals with an in-depth look at the rules for preparing forms 1120S and 1065. Part 1 focuses on entity classification choices and instructions for completion of Form 1065, US Return of Partnership Income. Part 2 focuses on preparation of Form 1120S, US Income Tax Return for an S Corporation.